The remarkable geographical isolation of Bhutan has provoked it to remain cut off from outside civilizations. 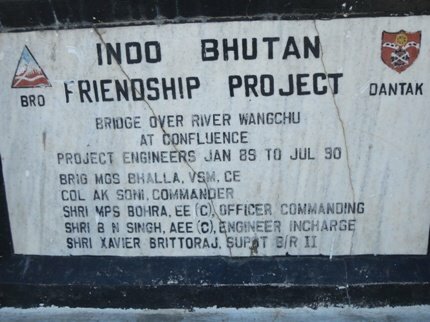 Some of this isolation is self-wrought as Bhutan is a nation fiercely protective of its own unique identity and independence. In fact, the country was so strict with preserving its cultural identity that foreigners were disallowed from entering the nation till the last few decades of twentieth century. People living in Bhutan mostly speak Sharchop and Dzongkha which are the main Bhutanese languages. These languages are tightly linked to Tibetan language and monks in Bhutan used to write an age-old variant of Tibetan language called Chhokey. In physical aspects, Bhutanese are quite like Tibetans and there are distinct similarities in the arts, crafts, jewelry and handicrafts used by Tibetans and the Bhutanese. In fact, people of both nations revere the tantric guru Padmasambhava. There are however several distinctive features of people, culture, religion and traditions of Bhutan. As of March 2017, the population of Bhutan is 789,936 based on the estimates given by United Nations. This is roughly 0.01% of the total population of the world. And Bhutan holds the rank 164 in the list of most populated countries. The total area of land in Bhutan is 38,063 km sq and the density of population is 21 per km sq. about 40.3% of the population lives in urban areas and the median age is quite low (27.2 years). The most sparsely populated areas of Bhutan are the rugged and severely cold greater Himalayan region and the arid tracts that border the Duars Plain. The two most populated areas of Bhutan are central and western Bhutan which are fertile and see relatively temperate climate. The south west part of the country (near Indian border) is also densely populated. The most populated Dzonkhangs in Bhutan are Thimphu, Chukha, Sarpang, Paro and Phuntsheoling while Gasa is one of the least populated Dzonkhangs. Gender parity exists in the traditional Bhutanese society except for a few gender fixed roles. A common example of gender field roles is the man working as a cloth maker and the woman as a weaver. Surprisingly, in the villages both men and women earn while in bigger towns and cities the man is the bread earner and the woman the homemaker. Love marriages are quite common and marriages are registered officially (and somewhat involuntarily) when the couple has lived together for a period exceeding 6 months. Divorce is not uncommon and is not a taboo topic. Our taxi driver informed me on my journey from Paro to Thimphu that he was getting divorced from his wife and I couldn’t detect any discomfort in his attitude!! There is a lot of focus on education and education is free in Government schools till the higher secondary level after which the students are given full or partial scholarships depending upon their merit. There is little or no gender disparity when it comes to education. The Bhutanese society is matrilocal i.e. the groom moves to the bride’s home after marriage but nowadays, most couples choose to live separately. Incidentally, Bhutan is one of those rare Asian countries where dowry is not practiced and inheritance is passed on to the daughters (matrilineally). There is also no obligation on women to take on their father’s or husbands name. Polygamy and Polyandry are not uncommon. 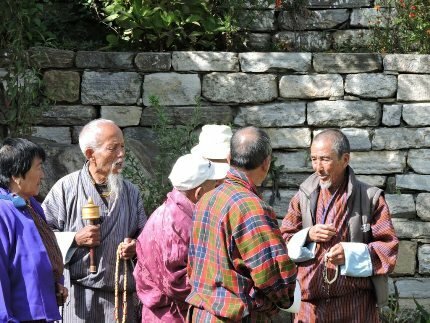 In Bhutan, you will find many people sharing the same combination of first and last names as there is a very limited selection of names to be chosen from. Sometimes people are identifying by the name of their village, locality or even house. People follow a fixed routine for prayers and meals and are quite rigid about those timings. The Immigration Office for example. Closes for exactly half an hour for lunch. Men and women working in shops (that I visited) settle down to have their simple staple meal of ema datsi and rice (this is the Bhutanese standard lunch) at around 2 p.m. people are refreshingly innocent and guileless and are often surprised by the amount of curiosity I showed in their culture and practices. Another aspect of the Bhutanese fascinated me deeply and that was their honesty. In my stay in the Dragon Kingdom, I lost my handbag twice (got it back twice) and my cell-phone once (got that back too) and was often called back to shops to collect the extra money that I had accidentally paid them (was often confused due to unfamiliar looking NU notes). One incident remains branded in my memory. there was a young Bhutanese girl who worked in a shop in Paro who came running almost a block searching for me to return my bag. All the shops in Paro look almost the same and I was distraught when I discovered the loss of my bag. Luckily, I had to endure just 5 minutes of distress as I saw the girl running towards me with a big smile on her face. Overcome with gratitude, I tried to reward her whereupon she innocently said “Oh, but this is what I am supposed to do…I didn’t do anything extra”. This sentence sums up the attitude of the average Bhutanese citizen…unquestioning honesty that is as natural to them as eating and sleeping. I had heard a lot about the preference of Bhutanese citizens towards Western tourists as opposed to tourists from Asian countries like India, Bangladesh, Nepal etc.. During my visit to Bhutan I saw slight traces of this preference though the people I encountered were unfailingly courteous. In Metta Resort and Spa (the hotel in which I stayed in Paro) there were a few tourists from UK apart from us. The fixed menu which was offered at night had only European/ Continental options inspite of our indicating our Indian food preferences many times. A friend of mine who did a project for the Bhutan Government about a decade back told me that the land which belongs to Sikkim and Doaars area was originally the property of Bhutan Government before being handed over to India in the Independence era. However, during my travels I saw many evidences of the Indo Bhutan allaince as most of Bhutans Highways and Roads are constructed with the help of India. Bhutan has a formalized dress code and a behavioral code named Driglam Namzha. This code explains how citizens of Bhutan dress and behave in formalized public places. Incidentally, the word Driglam means “discipline, regimentation, order and customs” while namzha means “the system”. Overall, the composite term means the rule for discipline in behavior. Since 1990 all citizens of Bhutan were supposed to follow the Driglam Namzha. I heard a rather unpleasant story about the Lhotsampas (citizens of Bhutan of Nepali origin) who had revolted against this imposition of the Driglam and hence got thrown out of Bhutan into refugee settlements. 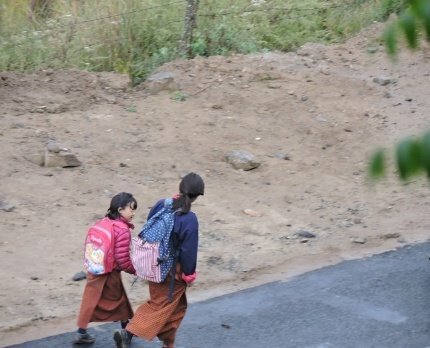 Currently, about 20% of Bhutan’s citizens live in Exile because of the rigorous implementation of the behavioural code and persecution of people who refused to follow that code. This was a coordinated political and administrative movement called “Bhutanisation”. The issue of cleanliness is taken very seriously by the Bhutan Government and they have initiated and implemented a series of rules and regulations that uphold the values of cleanliness and orderliness in Bhutan. 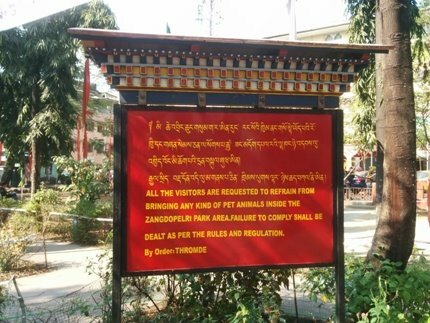 You can experience the stark difference in the Indian administrative system and the Bhutan administrative system as soon as you cross the border between Jaigaon and Phuentsholing. During my visit to Bhutan, I saw very few newspapers and then learnt that free media culture is not encouraged in Bhutan. In fact, media culture began in the 1980’s with the launch of Kuensel (Government owned publication) and right now Bhutan Times, Bhutan Observer and Bhutan Today are the only principal publications. Interestingly, the newspapers depend upon the government for 90% of their revenue and this says a lot about their ability to propagate free discussions. None of the hotels in Paro, Thimphu and Phuntsheoling (the ones in which I stayed) kept any newspapers and on one occasion the manager cheerfully informed me that news is mostly checked online. The lone newspaper I saw in Bhutan was being sold in the Xerox shop opposite the Phuntsheoling immigration office and it had the tagline “the people shall be informed”. It also cost 30 NU which is pretty high for a newspaper. Bhutanese men are supposed to be dressed in knee length robes with a belt (called a Gho) while women wear colorful blouses with a largish rectangular cloth tied around them (called a Kira) along with a brightly colored jacket. This is the dress code for any official occasion, public ceremony and festival with the only variation being the colour, texture and material of the dresses. 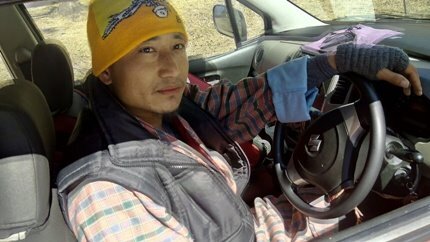 I came across many taxi drivers in my Bhutan trip and all of them were unfailingly dressed in the Gho. The taxi driver who took us to Punakha from Paro informed me that there was a fine of 1000 NU if he was caught leaving his head uncovered or if he forgot to wear mid knee length socks. There are Police check posts all over the traffic routes and they keep a sharp eye on the attire along with the car documents possessed by the cab drivers (Bhutan Government is very strict about its paperwork). Buddhism is the principal religion of Bhutan and it reflects clearly in all the domains of life there. Utensils and household items have religious symbolism, prayer flags are seen on random hills, roads and trees and prayer beads peek out unobtrusively from under the fashionable dresses of young teens. Religion here is not a separate domain, it’s a way of life that encompasses every other function of life. One interesting thing that I observed on my trip to Bhutan is that mostly all the roofs all fly a small white flag. Later, I learnt that these indicated that the owner has made offerings to the local God for appeasement. Each district in Bhutan (known as Dzongkhang) is ruled by a Dzong or a fortress with huge walls that serves as both the administrative and religious hub. These dzongs have chambers of justice, official rooms and coronation chambers apart from a monastery and praying hall. If you happen to travel to Bhutan, you will be struck by the groups of monks wandering through the towns and city roads carrying on all normal daily activities. Unlike many other cultures, being a monk in Bhutan doesn’t shut one out from enjoying worldly pleasures. I saw many monks in restaurants enjoying hearty meals, most have Facebook profiles and high end smart phones!!! Some monks who live in monasteries at high altitudes must bear climatic extremism regularly. The practice of letting one son/ brother serve in a monastery is a highly respected one and the family is said to earn good Karma. Monks in Bhutan generally join a specific monastery from the age of 6 to 9 and they are supposed to live under the rule of a headmaster. They learn Chokhey, English and Dzongkha and go on to study the theory of Buddhism. One day, each monk must make a choice between becoming a theologist or a practitioner of faith. A monk chooses a life of spiritual training and must report periodically to his spiritual master. Every monastery has an abbot or a Lama. The highest Lama of the land is Je Khempo (chief abbot of Bhutan) and he holds a position equal to the King. 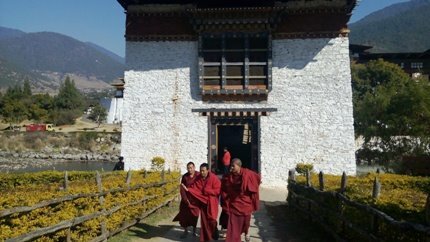 The Punakha Dzong is the most important Dzong of the country as it houses the preserved body of Shabdrung Namgyal and the 600 strong Central monk body who perform all the principal religious duties of the land. As you may have heard Bhutan was a pure monarchy till the year 1950 after which it slowly progressed towards democracy. The two most powerful leaders in Bhutan are the King (Jigme Namgyal Wangchuk) and the Prime Minister (Tshering Tobgay) along with the Je Khenpo (head of monastic association). 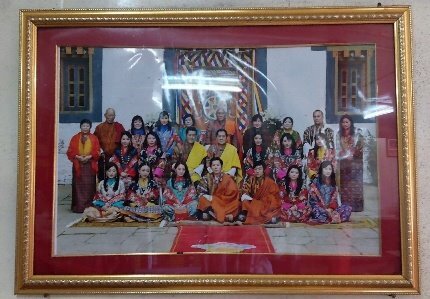 The Bhutanese citizens love their king and the royal family dearly and they have framed pictures and paraphernalia displaying royal pictures everywhere. Outwardly, Bhutan gives the impression of a happy and content nation governed by its framework of policies made towards promotion of “Gross National Happiness”.